I have had a number of positive and constructive responses to my last newsletter that indicated some of my ideas on the role of guides and drivers. I have been asked to share some of my ideas on tourist expectations. Over many years, Viva Safaris has been fine-tuned in respect of what is expected. First and foremost, the safari-goer is on safari to see animals. It is great if the accommodation and food are good and that the transportation, by road or air, is safe and reasonably punctual. In fact if there are any problems with accommodation, food and transport, then there will be a very negative shadow cast on the safari as a whole. If, however, a tourist is pampered by exquisite accommodation and superlative food but does not see too much on the game drives, then we have lost the plot. It may happen from time to time that the animals seem to be on strike but if a guest has booked a 4 or 5 day safari then the expectation is that some reasonable game viewing will happen. This may not happen if the lodge/operator are limited to one area only. 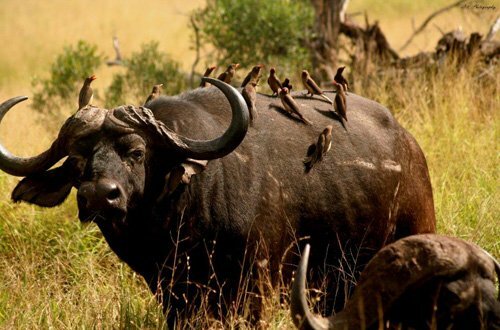 For example, in Olifants West Game Reserve, there has been a paucity of buffalo for an extended period – it is therefore extremely difficult to offer sightings of all Big Five here. My understanding is that tourists want different wildlife experiences. It is well and good to see the same lions in a particular area, perhaps doing different things, but it can become repetitive and consequently boring. At Viva we have designed the itineraries so as to avoid repetition. 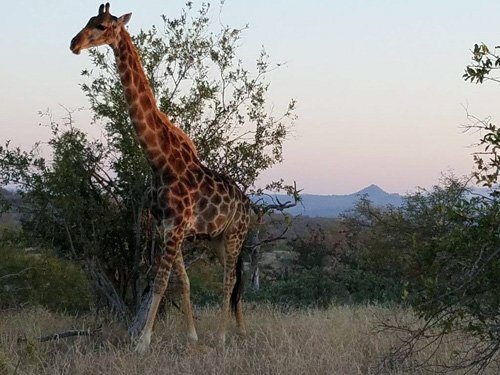 There is an eclectic mix of experiences with game drives on three different private game reserves, a bush BBQ, bush walks with armed rangers, full day Kruger Park safaris and an educational visit to a rehabilitation centre. As a package the tourist is exposed to various wildlife interactions that enrich the overall experience. Secondly, my experience is that tourists are very conscious of the affordability and value-for-money of different safari packages. Guests visiting South Africa are generally traveling far distances and the long-haul air fares are expensive. I believe that any safari product that is overpriced will not last long. We need to be realistic in our pricing. On the other hand, if a safari is priced at a “too good to be true” rate, then only the naïve and ignorant tourist falls for it. Over the years there have been a number of fly-by-night operators that offered cut-rate safaris and did nothing to satisfy the guests thus giving the whole industry a bad name. I have seen a change in tourist attitudes over the years. Today’s tourists are tech-savvy and are likely to do independent research into the value of various safari packages. Years ago, we depended to a far greater degree on our travel agent supporters. Nowadays we get a lot of repeat visitors and numerous word-of-mouth referral enquiries and bookings. 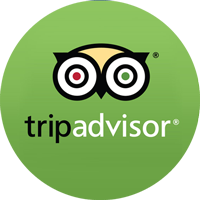 Although fora such as Tripadvisor and Hello Peter can be and are manipulated, they generally give a rough indication of the efficacy of an operation or a game lodge. Nevertheless, the majority of tourists will not rely solely on reviews that may not be genuine. When all is said and done, the proof of an effective tour operation is best measured by its success or otherwise during quiet periods. If other operators and lodges are relatively empty, whereas we are busy, then we know we are doing something right. 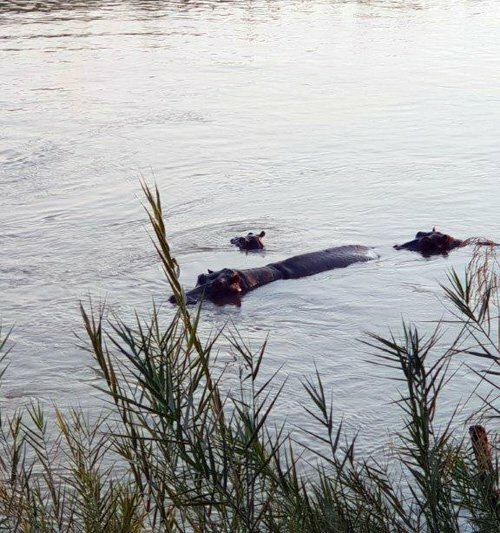 We found 15 hippos as well as 1 crocodile at the Olifants River one morning. Before the bushwalk, on the way there, we found a lion, a lioness and two cubs on the Barnards property. On the way back to the lodge we found a bull elephant on the Marula road. On other bushwalks we found our resident male black rhino, Zulu, lions on a kill – we kept far away – as well as excellent sightings of giraffe and zebra. The best bush walk included a great sighting of 5 black rhinos – these were 1 male, 2 females along with their calves. They we’re gently munching and didn’t pay us much attention. On one of my sundowner drives this month we found 1 female black rhino with her calf, then later on we found 2 lionesses on Barnards. That afternoon I saw 4 bull elephants on the Campfire cutline and then more black rhinos. We have found a herd of elephants regularly at Marula Boma. Driving on the Olifants road we found 1 male and 1 female lion on the road close by the Nonwane cutline and on the airstrip there was another male lion. On Barnards property we found 3 lionesses at Shigamba dam sleeping as well as 1 female leopard on the Marula road. The month of June here and so has cold come with it, rain has gone and bush starting slowly to become brown and dry. The buffalo have yet to come to the Balule area. We still eagerly await their arrival from the Kruger side. 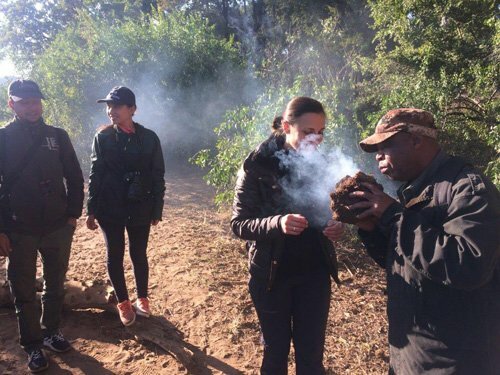 Bush Walks great – teaching guests about uses of elephant dung. Mornings and evenings are chillier than the afternoons but best time in the bush – love the beautiful sunsets in the evening and lovely clear skies at night. As for the drives and walks it’s been very good elephants always around and great tusker Ezulweni back again. Lion sightings been great as lot of new young were born last month. Kruger has been unbelievable with brilliant animal sightings. Leopard and lion sightings almost every day and just getting better every week. The bush is looking good – nice and open – so that we can spot the animals easily. It was not easy to see crocodiles because they are cold blooded and stay in the water until the day warms up. On one Sunset drive we went down Marula road and saw many elephants – guests were scared but very excited. Just before we reached Marula Boma we saw two hyena – it was so amazing we had a great time with my clients. The clients were very happy to eat BBQ dinner at Marula Boma in the middle of the bush. Black Rhino sightings have improved this month. My sundowner drives have been excellent as we managed to see lions near Ezulwini Lodge. Nature will always surprise you . I’m still enjoying my long leave. 1st June : Windy day, difficult day to find animals in Kruger, lions Timbavati riverbed and elephants, general game on s100, h7 and 4 white rhinos on the road. 4th : Huge herd of buffalo before reception, elephants Timbavati riverbed and general game drinking, s100 lions Xibotwana windmill. On h7 elephants drinking and 2 male lions near Orpen. 9th : Lions s100 4km from Satara main road, lots of game on s100,herd of buffalos 14km on s100, more game Nsemani Dam hyenas on s36, Rabelais road elephants, giraffes, zebras, kudus and etc. 11th : Lions Nsemani Dam, cheetah Nsemani windmill, general game on s100, elephants Xibotwana windmill, herd buffalos 2km after Xibotwana, leopard on h7 riverbed, buffalos after Orpen gate and 2 white rhino. I went on LONG LEAVE from 12 June. Everything has started drying out and the bush is therefore very much open. It is now the end of the rutting season and we enjoyed the sound of impala rams advertising their home ranges to the ladies. The drive to the bushwalk is always an exciting time to look forward to – it is always very special to find something on our way there. One morning Rex and I happened to find 2 black rhinos, a mother and calf. It was close by where we are starting the bushwalk, we watched them for a couple of minutes. The mother was munching along the way while that little one was trying its very best to eat like its mum. We heard them chew around the branches and to me hearing what the animals are doing is sometimes better that seeing them. As winter is definitely here now, waking up in the morning has become the bravest thing to do. At Barnards we got blessed by 1 male lion, 2 females and the 2 cubs. One of the females was the mother of the cubs and the other one was mating with the male. We watched the baby lion standing up, coming to get cleaned by his mom then the mom and this cubs and the other sibling start walking toward the big male, greeted him then move on. One special afternoon drive, I was driving on Rome 1, going down to the Spruit when I heard the birds alarm calling. We stopped for a little while, then eventually moved on, into the Spruit, the path there is very thick, as soon as I laid my eyes on my left hand side there was a leopard ! We managed to find quite a bit : Giraffe, Impalas, lots of zebras. There was a giraffe standing right in the middle of the road, when all of a sudden we heard a hell of a commotion and what a surprise, there it was, a female Black Rhino and her calf. We then made our way to our sundowner spot. On our way back to the lodge we saw a white rhino bull. 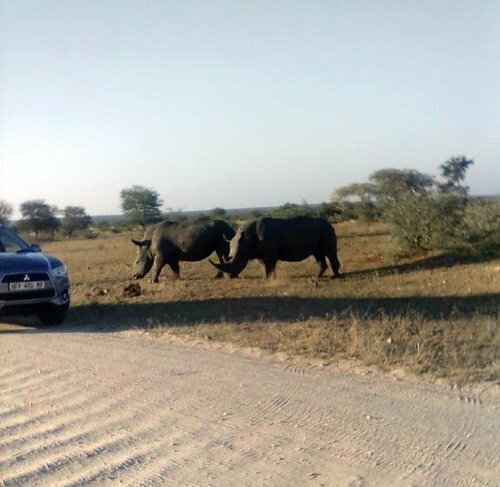 That was truly a drive to be remembered as seeing black and white rhinos on the same drive, getting to see the big difference between these 2 species. On 2 June, we had a very large group and we were 5 Cruisers out that one night. We started off with a very far sighting of an elephant. Then came a chameleon. Then the radio started to go on and on about some male lions. We were all disciplined and all went one by one to go and view these beautiful lions. 1st June : At Nsemane dam we found a pride of lion with more than nine cubs five males and eight females. One male walked right in front of the vehicle towards the dam where the cubs were busy playing with each other happily. 3rd : On S100 we found a female lioness chased by 2 buffalo bulls on the main road to Nwanetsi. On the H10 we found Wild Dogs hunting. On the H7 we found a big herd of elephant crossing the road for a drink. They were only 2m from the vehicle some of them were playing in front of us. On H6 we found 1cheetah with 3 cubs about 6Km from the main road to Satara eating an impala. On the S126 about 1km from the Sweni waterhole we found a leopard trying to catch an impala. At Welverdiend waterhole we found a big herd of buffalo – more than 100 – some were inside the water pan. On our way to the gate we find 3 rhino crossing the road less than 5m from the vehicle. UNBELIEVABLE – all in one day. 11th : On Balule Game Reserve we found 8 bull elephants at Tremisana lodge. They moved next to Warden’s place – very relaxed – we got close to them – less than 2m. At Ngwenya Dam we found one bull buffalo but he was not relaxed. At Shigamba dam we found one big bull white rhino very relaxed. At Rome one western cutline about one km from Olifants road we found a female leopard lying on the road for more than 5 minutes. At Marula Boma next to the dam we found a big male leopard walking towards us !! All in 2 hours before our Bush BBQ !!!! All though this month was a short one as I went on Long Leave it has still been absolutely brilliant with both sightings and just nature overall. Changes are happening as we can observe the bush slowly fade and change from lush green to a more hard and homely brown. Lovely walk through the bush and down beside the Olifants river where we observe the beauty of nature as well as the river’s residents : the pods of hippo and every now and then the crocodiles. Beautiful sightings of general game as well as lovely encounters with the big 5 such as Rhino and Elephant. It is one of my favourite drives and I can’t wait to catch up on my sightings. Leopard in the road! I took only two guests out for the sunset drive which started beautifully with some Giraffe and Kudu then as we came around the corner onto Sable road from Marula we found a beautiful male leopard strolling down the road and eventually went off into the bush. We arrived at Boma and there we found plenty of elephant all over the place. It has been a great short month and Mother Nature is going to impress us again next month. Good day to all our fellow Readers. Just after Orpen Boom gate there were 4 Cheetahs. Lots of general game until Bobbejaankrans where we stopped to enjoy the view. Guess what : we saw two leopards in the riverbed walking together. I think it was a mother and teenage son. A little further we saw around 120 Elephants – what a sighting ! Heading on to Nsemani we got Elephants and Buffalo relaxing not far from the hippos and a crocodile. 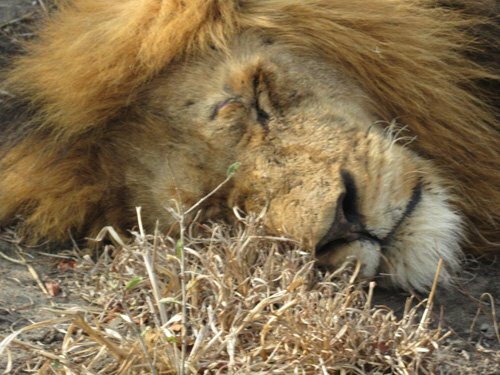 Going to S100, we found a pride of Lions sleeping at Shibotwana. After lunch, we drove straight back on the H7. Got good birds including a Tawny eagle .Very close to Orpen gate we got a pack of Wild Dogs that ate an impala close to our vehicle – a bit gruesome especially for my lady guests – but this is Africa. The day kicked off with a breeding herd of African Buffalo. Lots of general game. Afternoon drive H7 back to Orpen produced a great sighting of a White Rhino bull. On this day Motlala also got really interesting. I had the GM and some of his family. We began the drive with a sighting of a herd of Buffalo – very relaxed but they had a young calf and so I was very cautious. We drove along the Klaserie river and came across some Nyalas, Kudu, Zebra, Impalas and Warthogs. Further on a White Rhino and an Ostrich. Later we heard something alarm calling. So I switched off and we listened. A herd of Nyala ran quickly past. It was dark and I used the spotlight – saw a pair of eyes. I thought it was a Hyena but no, it was a young female leopard with a fresh kill – a young Nyala. We followed her for a while as she disappeared into the bush …we turned and there she was again walking with her fresh kill. We think she was carrying the kill to a den with young cubs. 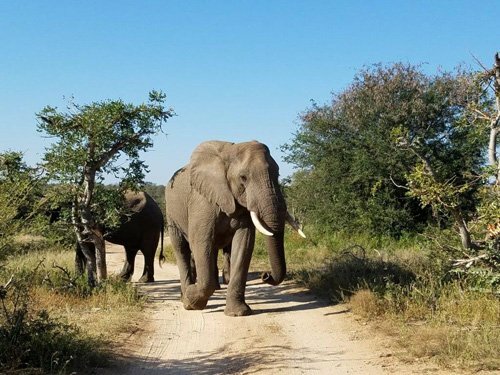 June has been an especially good month for elephant sightings, as Ezulwini of massive tusk fame has come back into the area on several occasions, with his bulls close behind and breeding herds usually not far away. 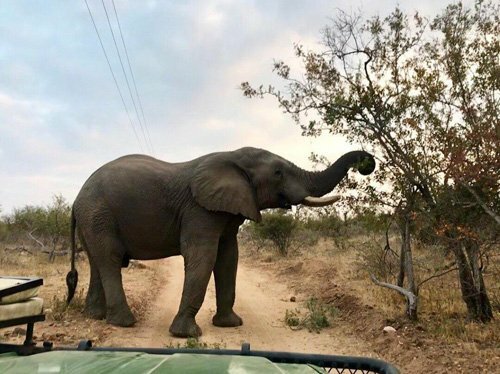 We have enjoyed having Ezulwini and several bull elephants coming to Tremisana’s property, drinking at the water holes and allowing us to view them up close from the Lapa. I have had several fantastic encounters with them on drive, specifically two amazing sightings on morning drive. On both occasions seeing a Big Tusker was a highlight for the guests. At the one sighting, which we sat at for over an hour, we watched two elephant bulls pull down high branches and feeding from a Marula tree, and we got to observe their respectful behavior towards Ezulwini when he came to join them feeding at the tree. 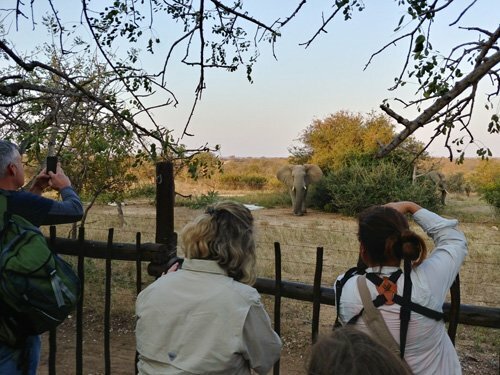 Viewing Ezulwini and the bulls up close was a highlight for one guest who was on his eleventh safari to Africa, and had never seen a Big Tusker. Another highlight of morning drive was a recent sighting of hyenas on an impala kill. We sat with the hyenas for a while as they laughed and fought over bits of the meat, then drove with them as they ran down along Sable Road carrying bits of meat and then disappeared into the bush, perhaps to bring food to pups in a den somewhere away from the road. Also recently on drive, guests and I spotted a female giraffe, with what looked like two identical in size very young giraffe calves, possibly twins which to my understanding are very rare in giraffe. I have had several good sightings of breeding herds of elephants, hanging out near Rome 1 and towards Marula Boma. We spent a long time with a very large breeding herd along Western Cutline. We were lucky enough to see several very young ones, including a calf suckling from his mother. The elephants have been very relaxed lately and allowed us to view them closely. We have also spotted Black Rhino and their calves on afternoon drive, specifically the female with the younger calf that is quite comfortable with the vehicle. Another highlight of this past month was having a group of guests very keen on birding, which was a challenge to point out of species I usually don’t cover with guests, including cuckoos, barbets, Pied Kingfishers at Campfire dam, and woodpeckers. Guests have enjoyed several great lion sightings this month on Sunset Drive. Close to Marula Boma we had a beautiful sighting of the three Machatan Males lying together alongside the road. We know two new males have come into the area, we’ll be interested to see if they make their way back down our side after being chased off in the past weeks. Another night, we were lucky enough to view two female lions on our way back from dinner at Marula Boma. On another night, we spotted a White Rhino along Olifants road returning from Boma. At the beginning of the month, I was once again in the sad position of not having a bed for Sandra and myself. While this clearly indicates that business may be booming, it is annoying to have to get accommodation at other lodges. Thanks to Laurence, Tess and Lauren for putting us up at Ezulwini River Lodge. I am glad that I went there as I was able to see the new improved rooms. Viva Safaris uses Ezulwini as our Luxury Lodge partner. I have decided to build a cottage for myself with the strict instruction that UNDER NO CIRCUMSTANCES WHATSOEVER may any guest ever be accommodated there. Game viewing has been excellent – I include a pic of elephants at the Lapa. We have replaced Tent 1. I am so impressed with what we bought that I am going to buy another one and we will then have 8 tents accommodating 20 guests. Animal sightings are great and I recently enjoyed a superb drive with my family and Nico on Motlala where we heard a leopard kill a nyala lamb and then watched her carrying her kill to her lair. The main lodge has had parts of the roof rethatched. It has picked up a bit from last month’s dismal occupancy. I had our top Cape Town agent visit with his family and they were astounded !! My family ( 4 children and their spouses and 5 grandchildren ) visited at the end of the month. Despite the cold some of them decided to spend a night at the Boma platform. Shannon kindly accompanied them and brought her rifle to keep things calm. 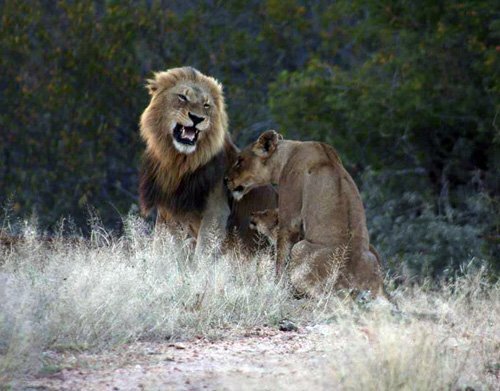 It was a great success – they saw a lioness and a hyena come to drink at the waterhole. Thankfully all returned in one piece ! I have arranged to use Nambu Lodge for the spillover we have at Tremisana. I have an agreement with the Olifants West Committee that we will not build any more accommodation at Tremisana for guests – so we are going to use Nambu Lodge in those periods when Tremisana is full. July 15 to 17 and July 25 are already full and we have other days in other months that are close to full. Nambu Lodge is on the same property that we do our Bush Walks and we have an excellent relationship with both owners. 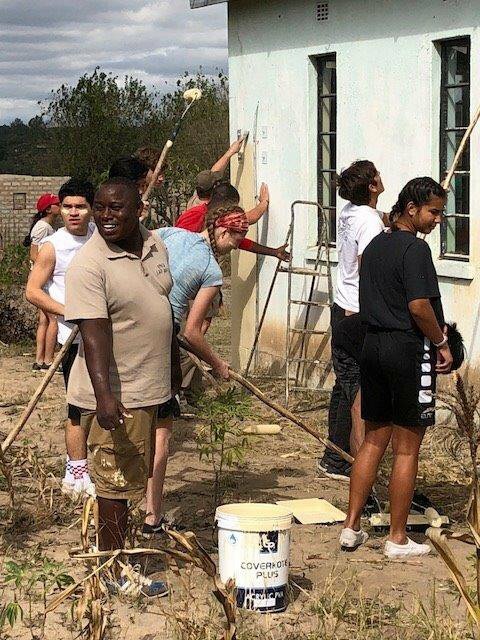 Thanks to Mitty High School who came at the beginning of June and helped paint the church buildings at Acornhoek. We had our first 3 volunteers that are working in conjunction with Catholic Volunteers Africa. Denise assisted in Maths tutoring. Mychelle set up the social media platforms for the Parish and her uncle Johnny fixed a ceiling and a huge crack in the wall. All three were very happy with the 14 day program. They were sad to leave but promised to return with bigger groups. We had a great stay and can’t say enough about Viva Safaris and the Tremisana Lodge and all the staff!! Everything from beginning to end was just perfect. We initially had a mishap with entering South Africa and missed our flight into Johannesburg. ( just know if traveling with minors under 18 that they need an original copy of their birth certificates in addition to their passport) . Thandy was so kind to push everything ahead for us and rebook our safari with no extra fees. From pick up in Johannesburg to drop off, everything far exceeded our expectations. The food was excellent, accommodations perfect, friendly staff, very knowledgeable Safari drivers, organized schedule that was full of activities! Saw all of the big 5 and tons of other animals! We LOVED everything about our stay here and will definitely be back!! The sounds of the African night are evident nightly as the Baboons are barking along with the hyenas laughing and the deep call of the Lion seem to get closer each night. There were two Leopards around cam o nightly, I heard them but didn’t encounter them on my walks back and forth. One of the tour which is not shown on tripadvicer is “under the star” tour. I spend 2 nights in the middle of the reservation area (accompanied by the tour guide), which was the best sleep I have ever had my entire life! They offer mattress and sleeping bag for the night, accompanied by the amazing sky and the sounds of animals, that was something incredible! One of the events which other tours doesn’t have is the “game hunting”, which means the tour guide takes you to tracking the animals on foot — guess what, we tract down the rhinos!!! BTW, don’t worry about the shower, they give you a room for taking showers and store your stuff, which is very sweet! Apart from the animals, all the stuffs are kind and nice, especially Ivy and Victor, they are so friendly and helpful. I really enjoy this trip, this is a money worth spend. I highly recommend to everyone! Hakuna matata! Thank you everyone from the Viva Safari, you guys are the best!